The 2012 United States Mint Presidential $1 Coin Proof Set™ contains proof quality examples struck at the United States Mint’s facility in San Francisco of the four 2012-dated Presidential $1 Coins. These four coins honor the twenty-first through the twenty-fourth Presidents of the United States – Chester Arthur, Grover Cleveland (1st Term), Benjamin Harrison and Grover Cleveland (2nd Term). This set is unique because it includes two different strikes honoring Grover Cleveland as he is the only US President to have served to non-consecutive terms as US President. This series first debuted in 2007 and honors the former Presidents in the order in which they served with a release rate of four new coins a year. The first coin to appear in the series was the George Washington Presidential $1 Coin. The Presidential $1 Coin series was originally created for circulation. However, 2012 marks the first year the series was not released for circulation as the Treasury Department ordered a halt to the practice. The reason given for the chance was a surplus of dollar coins in Federal Reserve vaults. 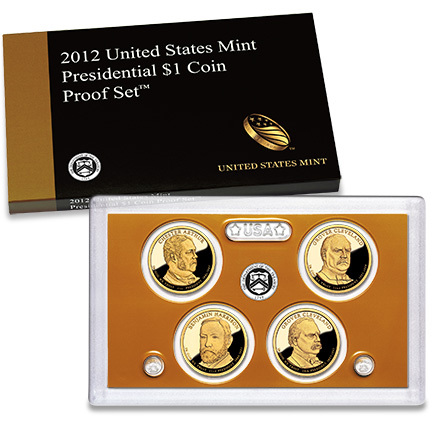 The 2012 Presidential Proof Set shows a release date of April 24, 2012. An issue price for the Proof Set is listed at $18.95, which is $1 lower than the 2011 Presidential $1 Coin Proof Set.